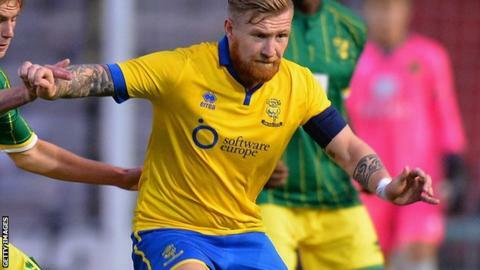 Captain Alan Power scored the decisive goal as Lincoln edged a five-goal thriller. Lincoln made it four wins from five games and moved up to eighth as they won an entertaining game at Chester. Matt Rhead netted his 11th goal of the season for the Imps when he headed Lee Beevers' cross into the bottom corner. Jordan Chapell levelled from Johnny Hunt's cross before Kegan Everington scored his first Lincoln goal. Captain Alan Power headed in to increase Lincoln's lead, before Ross Hannah pulled one back from Tom Shaw's pass, but it was too late for Chester. "To a man they were incredible. They dug in and they worked hard. I don't think anybody comes here and gets an easy ride because Chester are a good team. "That's what we're about. We're not the biggest squad in the division by any stretch of the imagination but we're together, we work hard and we don't let each other down. "The fans were great again. These are a special group of players and we've got good staff so it's a pleasure to be here at the moment." Match ends, Chester FC 2, Lincoln City 3. Second Half ends, Chester FC 2, Lincoln City 3. Chris Bush (Lincoln City) is shown the yellow card for a bad foul. Foul by Chris Bush (Lincoln City). Substitution, Lincoln City. Alex Simmons replaces Jack Muldoon. Ryan Higgins (Chester FC) is shown the yellow card for a bad foul. Tom Shaw (Chester FC) is shown the yellow card for a bad foul. Attempt missed. George Thomson (Chester FC) header from the left side of the box misses to the right. Liam Hearn (Lincoln City) wins a free kick. Substitution, Lincoln City. Liam Hearn replaces Matt Rhead because of an injury. Attempt missed. George Thomson (Chester FC) left footed shot from outside the box is too high. Offside, Lincoln City. Alan Power tries a through ball, but Alan Power is caught offside. Attempt missed. Jordan Chapell (Chester FC) right footed shot from outside the box is too high. Attempt missed. Ross Hannah (Chester FC) header from the right side of the box is too high. Assisted by John Rooney. John Rooney (Chester FC) hits the bar with a right footed shot from the right side of the box. Goal! Chester FC 2, Lincoln City 3. Ross Hannah (Chester FC) left footed shot from outside the box to the bottom left corner. Assisted by Tom Shaw. Chris Bush (Lincoln City) wins a free kick. Attempt saved. John Rooney (Chester FC) left footed shot from outside the box is saved.